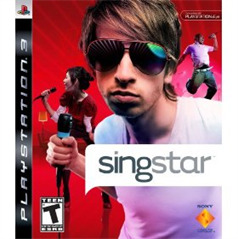 Become an online singing star SingStar for Playstation 3. Access a catalog of hundreds of downloadable songs featuring the real artists and videos, via the PS3 online SingStore. Become a global star as you share your SingStar experiences with friends and the online SingStar community via captured video, audio and photos. A perfect addition to the social gaming genre, SingStar will revolutionize the way you spend time with friends and family. Our Family Gaming Savvy Expert says: "While sitting on a sofa with a few friends, it was great fun to take turns singing the same song trying to outdo each other's score. It is surprising how infectious the singing is, even the most retiring of family members will put themselves up for the next song."